Who invented Aspirin? The name of the person credited with inventing Aspirin is Felix Hoffmann (1868 - 1946) who was the first person to patent the drug. Felix Hoffmann is not only famous as the German inventor of Aspirin but also as a talented chemist at the Bayer company. When was Aspirin invented? Felix Hoffmann invented Aspirin in 1897, during the Second US Industrial Revolution / Victorian period of invention (1850 - 1914). The invention of the drug originated in Germany and is considered a highly important achievement in the field of Medicine. Definition of Aspirin: Aspirin is defined as a prescription-free analgesic anti-inflammatory drug that reduces pain, fever, inflammation, and slows blood clotting. It is is a white, odorless, slightly bitter drug that belongs to the family of drugs called non-steroidal anti-inflammatory agents. Fact 1: Who invented Aspirin? Aspirin was invented by Felix Hoffmann in 1897 during the Second US Industrial Revolution era of inventions (1850 - 1914). Fact 2: Who invented Aspirin? Prior to the invention of Aspirin in 1897, there were no convenient tablet format drugs to reduce pain and inflammation. Fact 3: Who invented Aspirin? The ancients were aware of natural plant substances that could be used as herbal remedies to treat and prevent various illnesses. The Ancient Greeks, Romans, Egyptians and the Native American Indians used the boiled bark of the white willow tree as a pain reliever. Fact 4: Who invented Aspirin? The bark of willow is now known to contain salicin, which is a chemical similar to aspirin. Fact 5: Who invented Aspirin? The Ancient Greek physician Hippocrates (460 BC-370 BC) was known to prescribe the boiled bark and leaves of the willow tree to relieve pain and fever. Fact 6: Who invented Aspirin? The story of modern Aspirin began in 1832 when a French chemist called Charles Gergardt (1816 – 1856) experimented with salicin and created salicylic acid. His experiments intrigued the German chemist Felix Hoffmann. Fact 7: Who invented Aspirin? Felix Hoffmann was driven to such a degree that he was destined to achieve importance as the German inventor of Aspirin. Fact 8: Who invented Aspirin? The inventor of the modern Aspirin, Felix Hoffmann, was born on January 21, 1868 in Ludwigsburg, Germany and died on February 8, 1946. Fact 11: Who invented Aspirin? Following his education he was employed by Bayer in Germany, chemical, pharmaceutical and health care company. Fact 12: Who invented Aspirin? 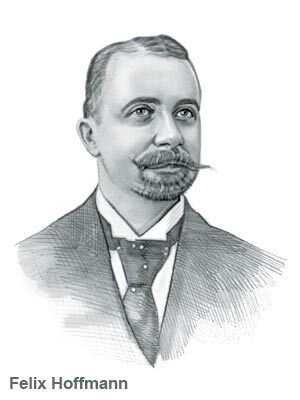 In 1897 Felix Hoffmann, studied Charles Gerhardt's experiments and the pain relieving, anti-inflammatory properties of acetylsalicylic acid and Bayer expressed a strong interest in developing a product to alleviate pain and reduce fever. Fact 13: The flower buds of Meadowsweet also contained the natural form of salicin and a combination of Meadowsweet and White Willow, in its synthesised form of acetylsalicylic acid was used to produce the new drug. Fact 14: Felix Hoffmann successfully used the drug to alleviate his father's rheumatism and in 1899, Bayer distributed a powder, developed by Hoffmann, to physicians to give to patients. Fact 15: The word 'aspirin' was derived from "spirin" based on scientific name of the meadowsweet (Spiraea). Another chemist at Bayer called Heinrich Dreser (1860 - 1924) came up with the name for the new drug. Heinrich Dreser had worked with Felix Hoffmann on the development of Aspirin and went on to create the widely used modern drug Codeine. Fact 16: In 1900 Bayer introduced Aspirin in water-soluble tablets, rather than the original powder for. The water-soluble tablets were the first medication to be distributed in this form. Fact 17: In 1915 Aspirin was made available available without a prescription in tablet form. Fact 18: Felix Hoffmann retired in 1928 and spent the rest of his life in Switzerland where he died on February 8, 1946. Fact 19: Aspirin was a great success and became a 'must have' addition to medicine cabinets but the story of Aspirin continued when new benefits of the drug were discovered. Fact 20: In 1948 Dr. Lawrence Craven, a California physician noticed that aspirin reduced the risk of a heart attack. Dr. Craven recommended his male patients (between 40 and 65 years of age) take preventative doses of aspirin. Dr. Lawrence Craven monitored 400 of his patients for the next two years and discovered that not a single patient had suffered a heart attack. Fact 21 - Impact: How did Aspirin impact the world? The impact of the invention of the versatile Aspirin was a sizeable step to improving the field of Medicine. Who invented Aspirin? Now you know that Felix Hoffmann was the person who invented Aspirin! We hope that the facts in this article have provided the answers to all of your questions about the invention of Aspirin and its famous inventor, Felix Hoffmann.